You are browsing the archive for 2019 March 04. Artifacts on display at Don Miller’s farm in 2014. For more than seven decades, Miller unearthed cultural artifacts from North America, South America, Asia, the Caribbean, and in Indo-Pacific regions such as Papua New Guinea. FBI agents searching an Indiana house in 2014 were shocked to discover a hoard of 2,000 human bones likely stolen from Native American graves. The bureau, which announced the grotesque discovery in March 2019, estimates that the bones represent 500 people. 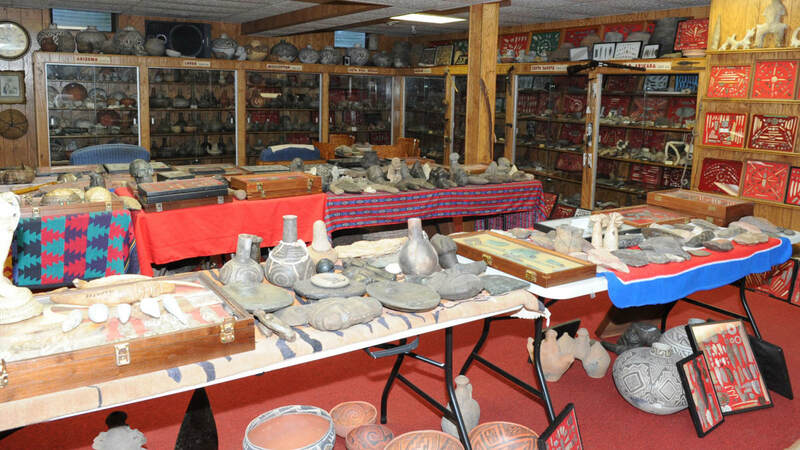 Far from an isolated incident, however, the discovery is only the latest in a long history of Native remains being stolen from their burial sites by collectors and museums. The theft of Native remains “dates back to colonization of the western hemisphere,” says Shannon Keller O’Loughlin, executive director of the Association on American Indian Affairs and a citizen of the Choctaw Nation of ​Oklahoma. European settlers stole ceremonial burial objects and human remains from Native American graves, and some took body parts like scalps from the Native people they killed. Institutions in the U.S. and Europe were especially interested in acquiring Native human remains during the 19th century in the name of “race science.” This pseudoscience was based on the debunked notion that different races exist on a hierarchy, with white people being superior. One of the most popular versions of this was “phrenology,” the study of skull size to determine intelligence and morality. “After the Civil War the Surgeon General issued orders to Army medical personnel to collect Native American human remains for study,” writes William Johnson, a Saginaw Chippewa citizen and curator at the Ziibiwing Center of Anishinabe Culture & Lifeways in Michigan, in an email (Johnson has consulted on the FBI case in Indiana). Designers fashioned a mid-century world visually inspired by Dr. Strangelove, Edward Hopper paintings and more. To transport “Project Blue Book” viewers into the top-secret world of the U.S. government’s Cold War-era U.F.O. investigations, production designer Ross Dempster and his team were tasked with conjuring a moment in time—from scratch. The drama series, in its first season on HISTORY, is based loosely on the real-life story of Dr. J. Allen Hynek, a brilliant astronomer recruited by the U.S. Air Force to scientifically scrutinize the growing number of saucer sightings, alien-abduction claims and more during the early 1950s. HISTORY talked with Dempster, whose credits also include the recent reboot of “Lost in Space,” about how he creates environments that bring mid-century history to life onscreen and evokes the anxiety of the Atomic Age and the mystery of the unknown. What does a production designer do? Production design is the world in which our characters inhabit. It’s my job, along with the director and director of photography [DP], to make sure we come up with something creative that pushes the story along, makes it believable, and absorbs the audience. 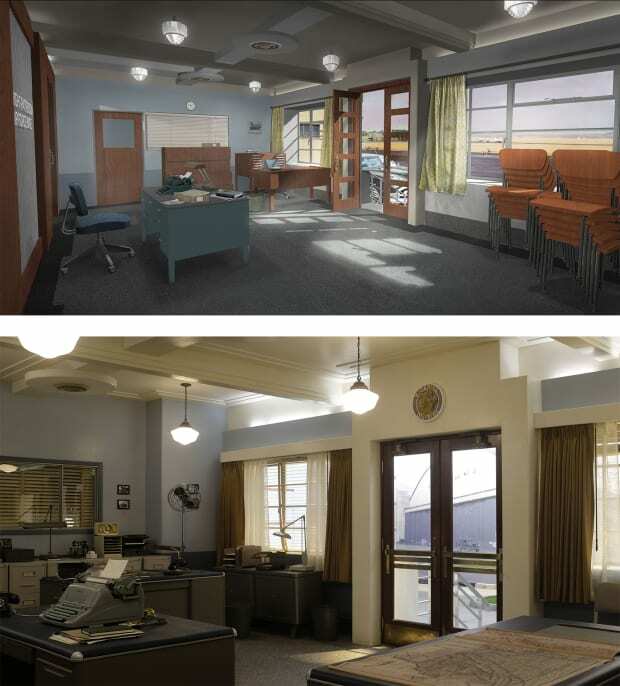 Concept drawing, top, and set photo of the Project Blue Book headquarters reception room, which was designed to evoke the federal Art Deco look of the 1920s and ’30s. CREDIT: Drawing Ross Dempster, Photo: Eduardo Araquel/HISTORY. How would you describe the setting for ‘Project Blue Book’? We’re in 1951-52, so you’ve got this post-war thing that all the characters are living in. Rather than making it scream out as stereotypically ’50s, I wanted to keep it in the realm of reality and show the time periods before that. In Dr. Hynek’s house, for example, there are antiques in the bedroom that were meant to be pieces that might have been handed down to the couple by their parents. Alongside that, you have modern furniture that they’ve purchased more recently. All of that tells a story, and makes the characters more real. What mood were you trying to evoke in the key sets? Were you given a specific brief? political will to fight terrorism emanating from Pakistan. Pakistan, a Muslim-majority neighbor, as the ultimate enemy. invasion, for example, and the ongoing Rohingya crisis). After peacefully demonstrating in front of the White House, 33 women endured a night of brutal beatings. Dorothy Day was described by her fellow suffragists as a “frail girl.” Yet on the night of November 14, 1917, prison guards at the Occoquan Workhouse, did not hold back after she and 32 other women had been arrested several days earlier for picketing outside the White House. At first, Wilson tolerated the women’s protests, smiling at them as he passed and even inviting them in for coffee (they turned him down). 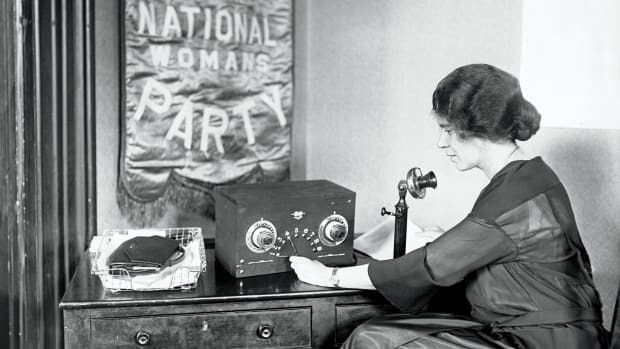 But things began to change after the U.S. entered World War I in April 1917, and the NWP chose to continue picketing the White House, even as the mainstream suffrage movement, led by NAWSA’s Carrie Chapman Catt, threw its support behind the war effort. National Woman’s Party members being arrested as they picket with banners before the White House East Gate, in August 1917. That same month, police began arresting the suffragists for obstructing traffic. At first, the women were released quickly, and without penalty, but soon the courts began handing out prison time. But the women kept coming back. be voted on this week. undermines American security and values, will continue. passed the Sanders-Lee-Murphy resolution late last year. should reduce or end arms sales.